Jacobs Ladder 2 Exercise Machine is an innovative and revolutionary cardio workout machine that provides unmatched weight loss results in a short amount of time. 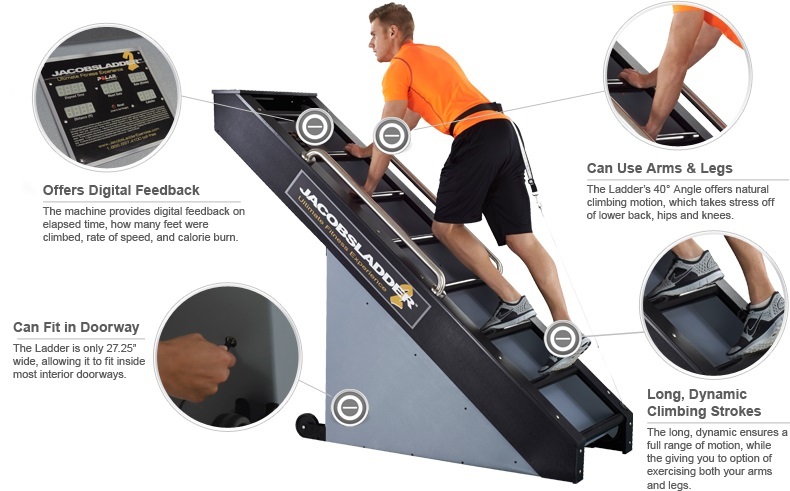 The Jacobs Ladder 2 was originally designed for athletes and fitness professionals, now available to the public, this unique total body workout system provides peak aerobic and anaerobic conditioning without the stress on the joints or stresses of typical workouts. The ingenious design of the Jacobs Ladder 2 exercise machine is adjustable to assist users of all shapes and sizes and is self-powered, relying on the user to determine the speed and resistance of their own workout. This allows the device to be used anywhere, as no power supply is required. The machine is set at a 40° angle to mimic the body's natural climbing motion and to reduce strain on the lower back, knees and upper body joints. 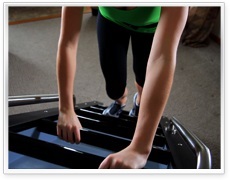 No other device on the market provides a workout that compares to the Jacobs Ladder 2 exercise machine. The built-in digital display tracks heart rate, calories burned, the distance climbed in feet, and the rate of ascent for easy tracking. 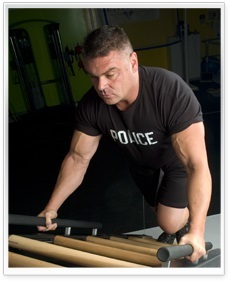 Ideal for fitness studios, gyms, personal use, or for specialized training for police, firefighters and the military. Burn fat and gain lean muscle fast, buy your Jacobs Ladder 2 exercise machine today and start taking your cardio workouts to a higher level. 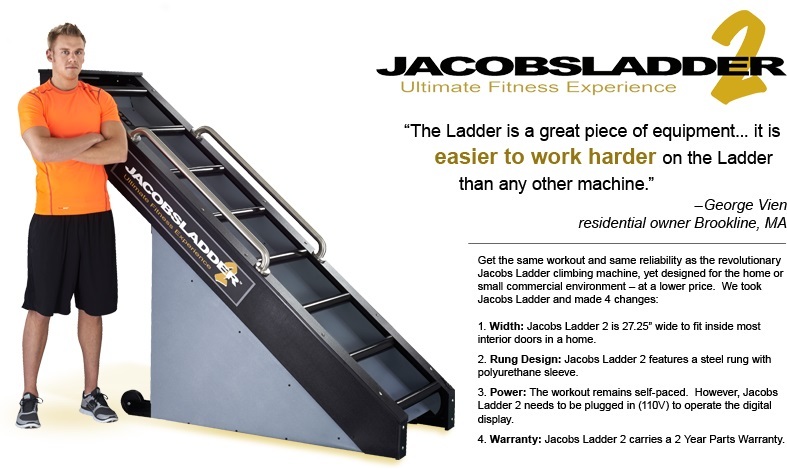 Get the same workout and same reliability as the revolutionary Jacobs Ladder climbing machine, yet designed for the home or small commercial environment - at a lower price. They took the Jacobs Ladder and made a few changes: The Jacobs Ladder 2 is 27.25" wide, allowing it to fit through most interior doors in a home. 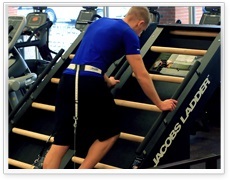 The Jacobs Ladder 2 featured steel rungs with polyurethane sleeves. The workout remains self-paced. However, the Jacobs Ladder 2 needs to be plugged in to operate the digital display. 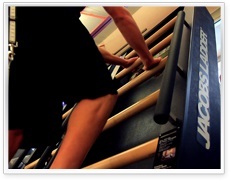 The Jacobs Ladder 2 is almost identical to the Jacobs Ladder featured on the Biggest Loser. Call 1-800-875-9145 to talk with one of our agents at FitnessZone with any questions you may have about the Jacobs Ladder 2. 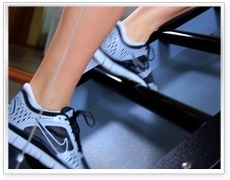 Order your Jacobs Ladder 2 from FitnessZone.com today and take your cardio workouts to new heights and start to burn MORE calories and lose MORE weight. 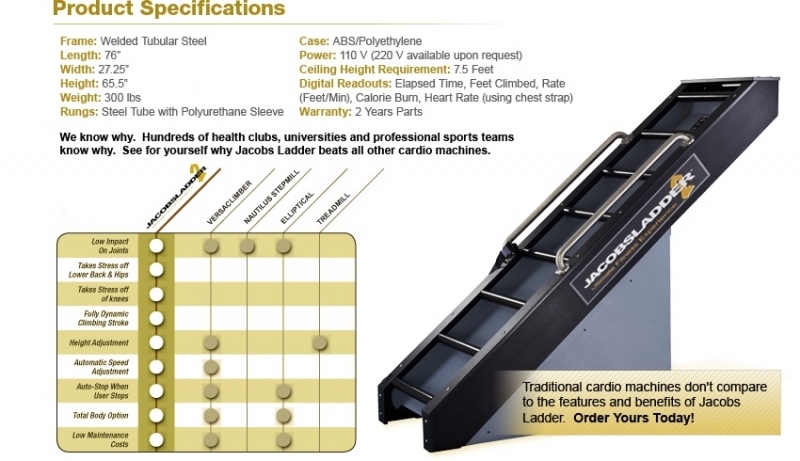 Order Your Jacobs Ladder 2 from FitnessZone.com today! Study after study confirms that exercise using both the arms and legs requires more energy expenditure, and therefore burns more calories than exercises using just the arms or the legs. So, unlike stair-climbers, stationary bikes, and other standard club equipment, Jacobs Ladder can offer exercisers a superb cardiovascular workout in a relatively short amount of time. The addition of Jacobs Ladder to your workout will provide anyone looking for weight control with a unique fitness experience, while mixing up your routine.